We can provide the EQi 2.0 and EQi 360 range of emotional intelligence assessments to aid in your professional and personal development. 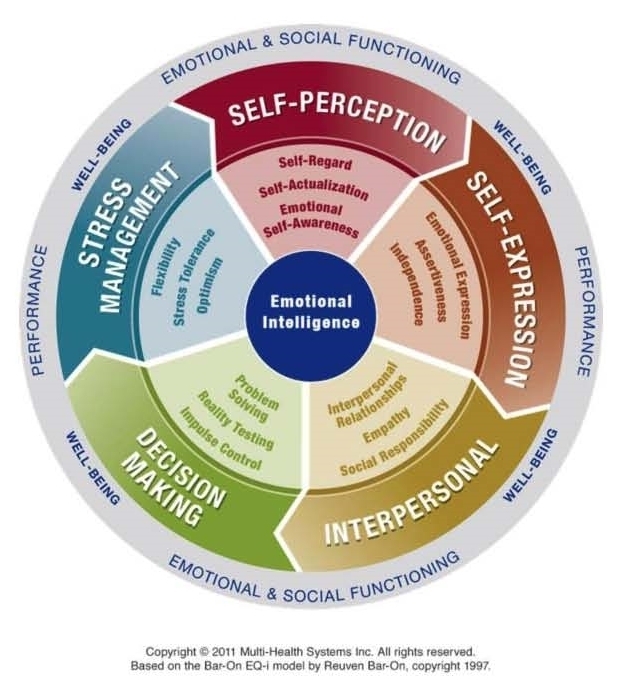 The EQi 2.0 Emotional Intelligence framework is one of the most widely used, empirically proven and scientifically valid instruments available in the world today. In fact over 1 million people have taken the EQi Assessment. We use EQi 2.0 either as part of a Coaching Program or it can be used as part of a leadership development program. It can also be used as part of a Team Building program. The EQi 2.0 model is a 1-5-15 factor structure which contains 133 questions. Each report gives an overarching EI score (Total EI), broken down into five composite scores which, in turn, are broken down into a total of 15 sub-scales as shown below. Self-Regard – Respecting oneself while understanding and accepting one’s strengths and weaknesses. Self-Regard is often associated with feelings of inner strength and self-confidence. Self-Actualization – Persistently trying to improve oneself and engage in the pursuit of personally relevant and meaningful objectives that lead to a rich and enjoyable life. Emotional Self-Awareness – Recognizing and understanding one’s emotions. This includes the ability to differentiate between subtleties in one’s own emotions while understanding the cause of these emotions and the impact that they have on the thoughts and actions of oneself and others. Stress Tolerance – Coping with stressful or difficult situations and believing that one can manage or influence situations in a positive manner. Optimism – Remaining hopeful and resilient, despite occasional setbacks. It is an indicator of one’s positive attitude and outlook on life. Emotional Expression – Openly expressing one’s feelings verbally and non-verbally. Assertiveness – Communicating feelings, beliefs and thoughts openly, and defending personal rights and values in a socially acceptable, non-offensive, and non-destructive manner. Independence – Being self directed and free from emotional dependency on others. Decision-making, planning, and daily tasks are completed autonomously. Reality Testing – Remaining objective by seeing things as they really are. This capacity involves recognizing when emotions or personal bias can cause one to be less objective. Impulse Control – Resisting or delaying an impulse, drive or temptation to act and involves avoiding rash behaviors and decision making. Interpersonal Relationships – Developing and maintaining mutually satisfying relationships that are characterized by trust and compassion. Empathy – Recognizing, understanding, and appreciating how other people feel. Empathy involves being able to articulate your understanding of another person’s perspective and behaving in a way that respects others’ feelings. Social Responsibility – Willingly contributing to society, to one’s social groups, and generally to the welfare of others. Social Responsibility involves acting responsibly, having social consciousness, and showing concern for the greater community. While the EQ-i 2.0 identifies the level of a client’s emotional and social functioning based on his or her responses, the EQ 360 assessment provides a much more in-depth analysis by having those who work with the client also provide their feedback on the same range of EQi areas.